Warning: This post may be graphic and appalling to fish activists (if that’s a real thing), but let me say this: Although the fish in these photos WAS harmed, it was cleaned respectfully and quickly. And it was thoroughly enjoyed. So its life was complete (in the grand scheme of things). At first, I thought this post might be too gruesome to publish, but I decided that long-term, I really wanted to document my granddad’s method . He’s been doing it well (and in his own, unique way) for many years, and here I’ve broken it down into steps so that I (and other family members) can remember each one for future use. I’m not gonna lie, one of my favorite things about fly fishing in Missouri with my grandfather is when we go to clean the fish after the bell tolls. There’s a “community cleaning station”, and I NEVER get tired of the amusement it gives me to watch grown men struggle with cleaning a fish, while my grandfather glides effortless through it (preserving more meat than most). Honestly, it’s laughable. I want to tell them, “Hey, if you would just watch and learn, you wouldn’t be wasting so much fish!”… All of these guys with electric knives and their manly “cut off the head ways”… If they were to just take a moment and learn from my grandfather, they would a) make it a lot easier on themselves and b) have a lot more fish meat to enjoy. Seriously, he’s the best, and that’s why I’ve chosen to document it. This is the only way I’ve ever been taught to clean a fish, and I must say, it works. Even for beginners. Note: Please forgive my photos for this post. My camera battery died and I only had my cell phone, which yes, I had to clean fish guts off of after this. Ha! First, let me say that I love that my granddad keeps his own “cleaning supplies” in the bed of his pick up truck at all times. 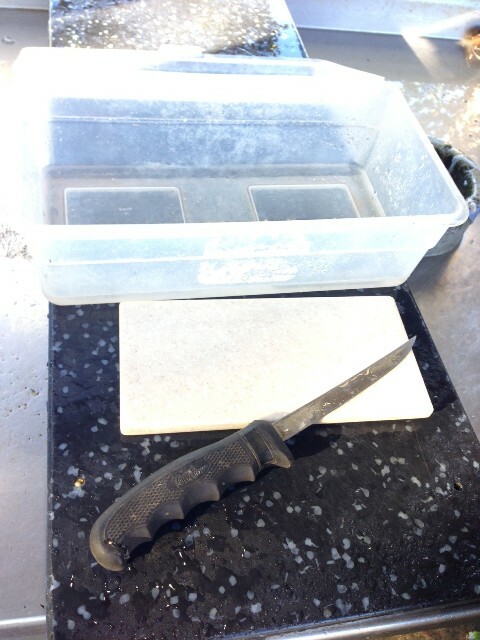 Those supplies include: a Tupperware container, a good cleaning knife, Ziploc bags and a small piece of silestone (he simply doesn’t trust the cleanliness of the “provided” workspace at the park cleaning station). 1. 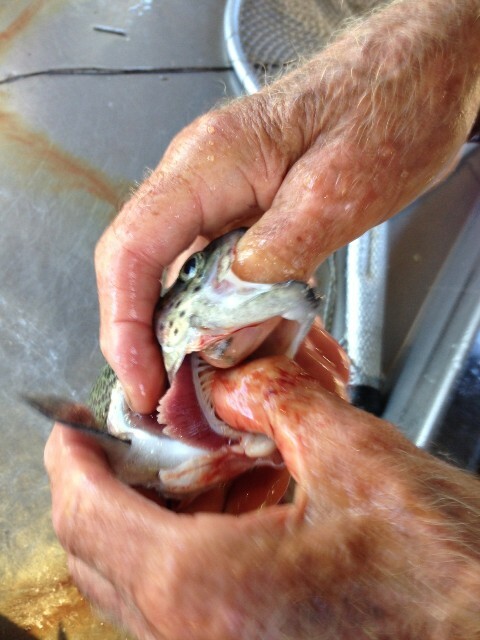 Hold the rainbow trout by the front gills using your thumb. 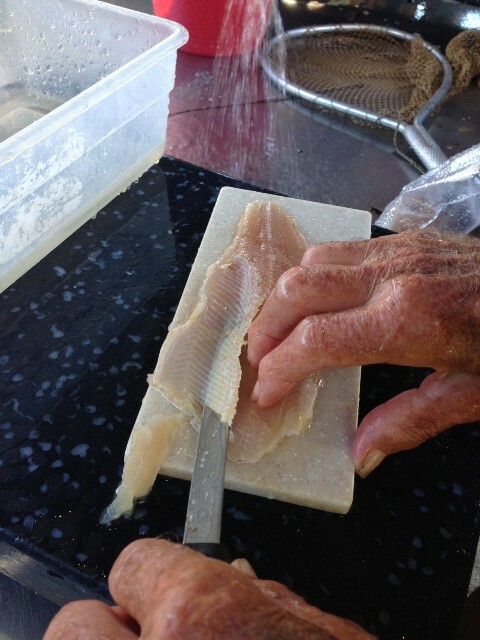 With a sharp knife, cut a slit in the belly of the fish from the bottom fin to just below the mouth. 2. 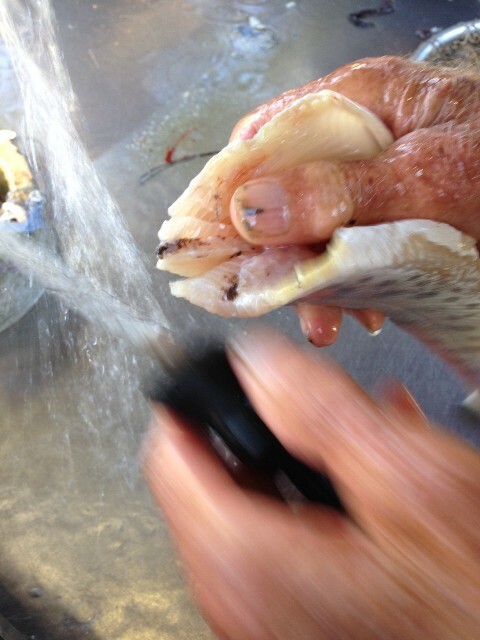 Use the knife to cut a slit directly underneath the mouth of the fish. There are two fleshy parts on either side, you want to cut through one to the other here. 3. 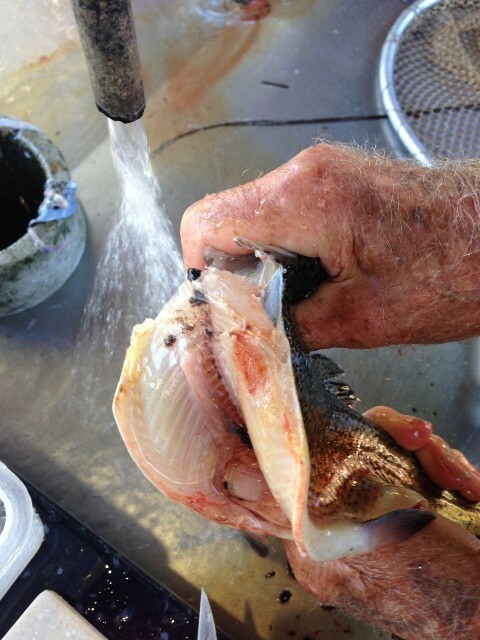 Firmly grip the inside of the fish’s mouth and the lower part of the jaw that you cut the slit in (#2). 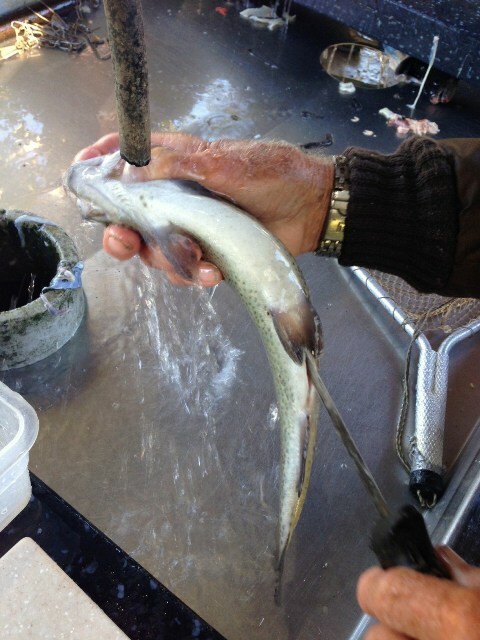 Pull the jaw/mouth down, thereby expelling the fish’s guts in one fell swoop. 4. 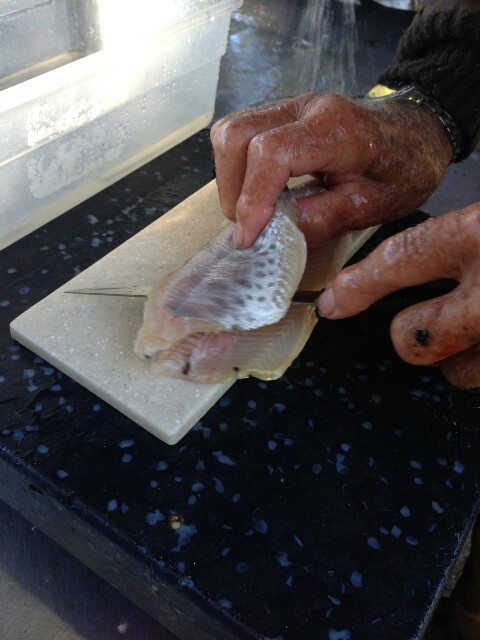 Snap back the head of the fish and continue to pull the skin off from the outside, working along the fins closely as needed to loosen the skin from the flesh. 5. 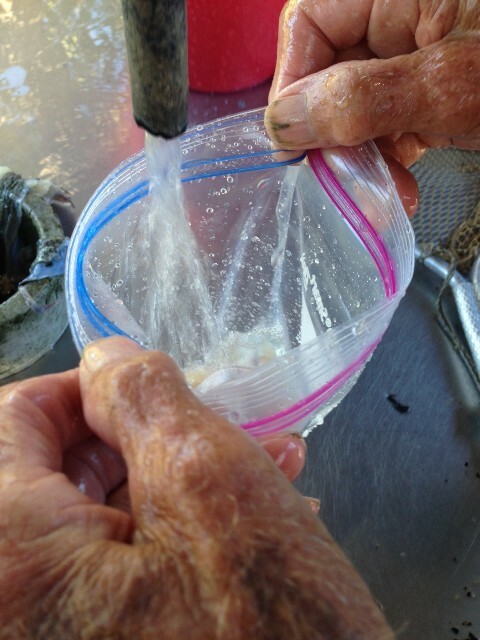 Pull off the fish skin in one fluid motion and discard. 6. 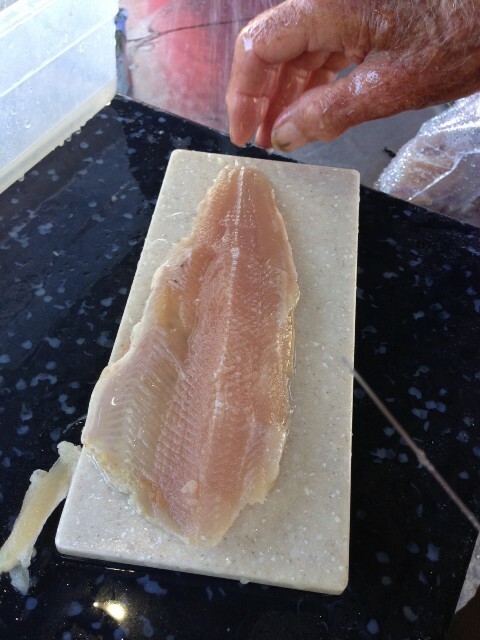 On both sides of the fillet, cut a slit at the front of the fish’s spine, on either side. 7. 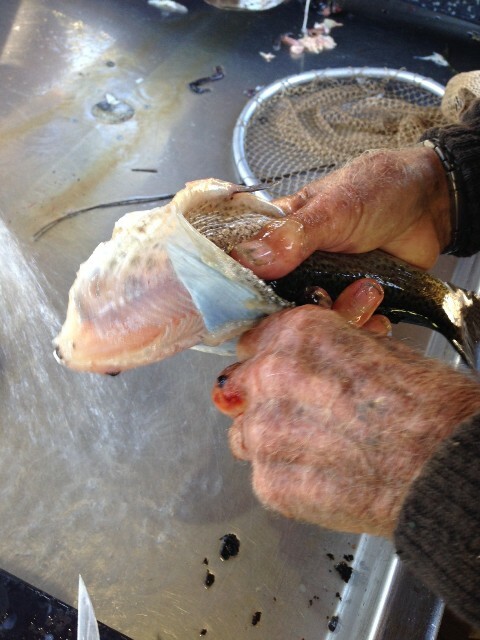 Carefully, using the fish’s spine as a guide, use the knife to cut the meat away from the bone. 8. Turn the fish over and repeat step 7 for the other side. 9. 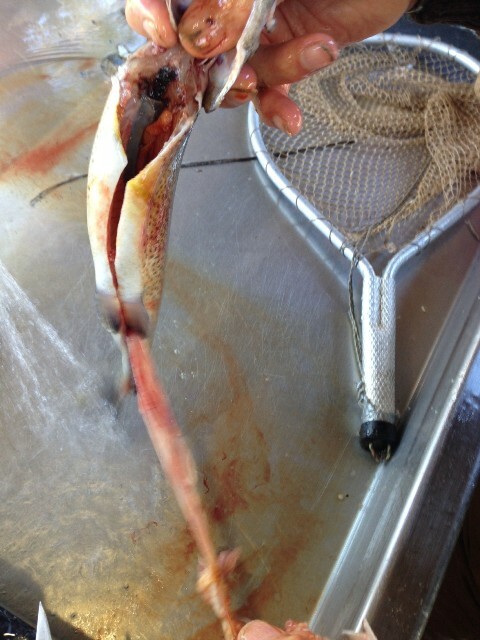 Discard the fish spine/bones and then use your knife to trim away any excess bones from the fish flesh. Look at that beauty! No butchered, not mangled. Gorgeous, delicious rainbow trout! 10. Place the fileted fish in a ziploc bag with water – this makes it super easy to cook for dinner or to freeze if you want. 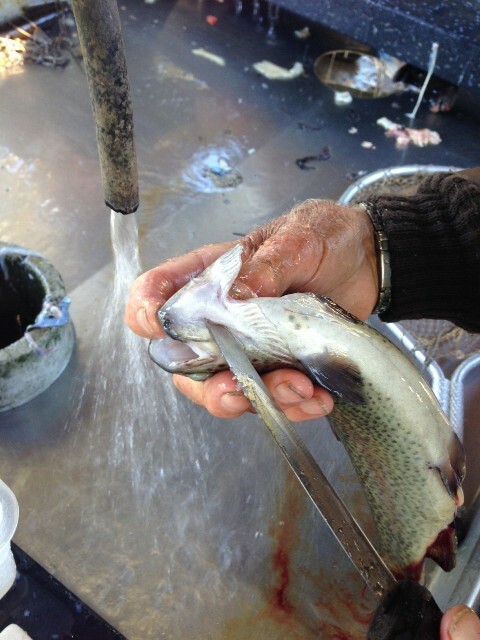 There you go, Rainbow Trout cleaning at its finest. 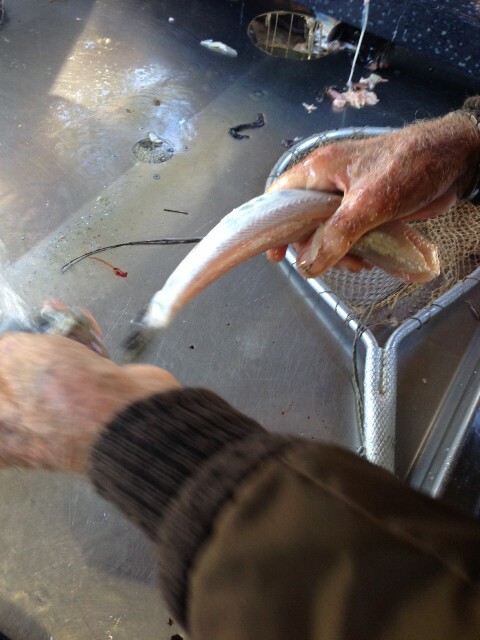 Thank you, Granddaddy, for teaching me such a great and efficient way to enjoy beautiful rainbow trout!